Angela Lederach talks with young people in Colombia during a Youth Provokers for Peace movement camping trip, which helped youth connect across villages that had been divided by armed conflict. The young people of war-torn northern Colombia want their homes and their lifestyle back. Displaced from their villages by guerrilla and paramilitary groups, they have spent the last 10 years in urban centers—making them prime targets for recruitment by those same criminal enterprises. But rather than falling prey to a violent cause, they’ve founded a successful peace-building movement. 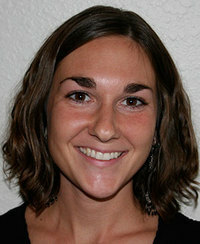 Notre Dame Ph.D. student Angela Lederach ’07 wants to know why. Lederach has spent the last two summers living in Cartagena, Colombia, researching the Peaceful Movement of the Alta Montaña. She plans to return in August for at least a year to continue researching the organization for her dissertation. Bringing an anthropological lens to the study of peace processes has been invaluable, she said. “Anthropology involves a commitment to long-term ethnographic research—observation while participating in the daily life of the people—and it reveals different forms and practices that you might not get in larger quantitative studies or generalized historical narratives,” Lederach said. During her first summer in Colombia, Lederach was surprised by the level of meaningful youth participation in the movement. More than 600 young people from 52 villages now participate in the youth wing of the organization. 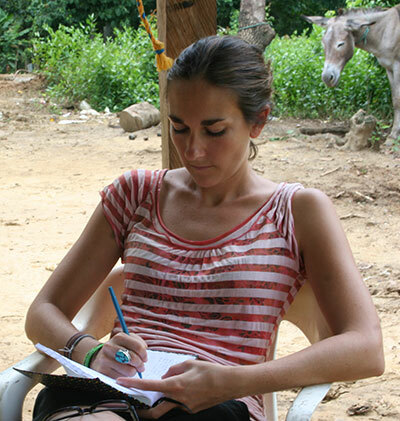 Lederach writing field notes in Alta Montaña, Colombia. Lederach, a Notre Dame Presidential Fellow who in March won a Fulbright U.S. Student Award in support of her dissertation research, said the Notre Dame anthropology program is distinct for its integrated approach to the field. Her work with Professor Agustín Fuentes, who chairs the department, has led her to consider her research through a biological, multi-species lens. Lederach majored in anthropology and peace studies as an undergraduate at Notre Dame and has worked and researched in Central America, West Africa, and Southeast Asia. In 2011, she co-authored a book on healing and reconciliation, When Blood and Bones Cry Out: Journeys Through the Soundscape of Healing and Reconciliation, with her father, John Paul Lederach, a professor of international peacebuilding at the Kroc Institute for International Peace Studies. She was excited, she said, to return to Notre Dame to join the newly created graduate program in anthropology and peace studies. Originally published by Carrie Gates at al.nd.edu on April 06, 2016.